Autodemo throws it back to 2004. Monster was on the rise, but they needed to demonstrate the ease of their platform. The demo begins by showing employers how easy it is to post an employment ad on Monster. The process starts by filling out basic informative detail of the position before going live. Eloquent narration makes sure to inform potential clients that Monster doesn’t charge by the word ala newspaper job postings. From there, a final screen confirms the safety of payment and allows you to preview the final copy. In 2017, this might seem quaint. But, this was revolutionary for 2004. 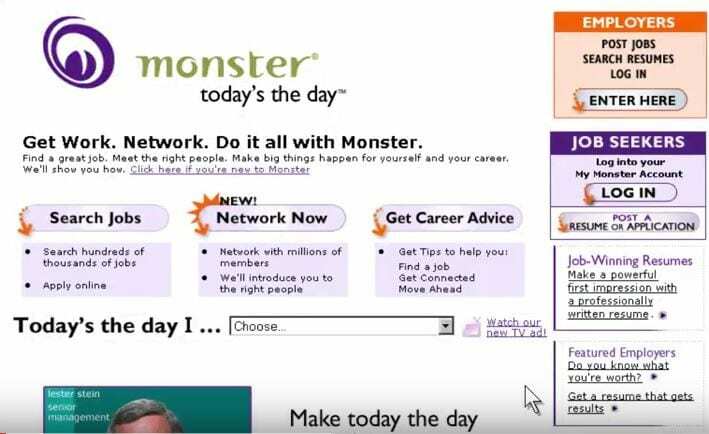 Monster has been benefiting employers and job seekers for quite some time. Monster had an amazing 2004. They were one of the most visited job sites on the Internet. Plus, they had come off a rather impressive string of Super Bowl ads that further increased their user base. But, business growth dictates educating new clients in the fine art of using your product. When Autodemo crafted this demo video for Monster, the objective was simple. Monster wanted more clients to be aware that the digital job board landscape was easy, instant and affordable. In an industry that is now defined by Monster’s business model, it’s intriguing to see where it all began. What Else Was Happening in 2004? Autodemo Throwback Thursday is taking another trip back in time. How well do you remember 2004? Feel free to share our Top 10 Happenings of 2004 with your friends and fellow industry influencers. Turkey abolishes the death penalty. Russian President Vladimir Putin announces that his country will pursue ratification of the Kyoto Protocol, regarding protection of the environment. The UN Security Council calls for the removal of all foreign (Syrian) troops from Lebanon. Yasser Arafat, President of the Palestinian National Authority, dies. Former President George H. W. Bush celebrates his 80th birthday by skydiving. Former President Gerald Ford suffers a stroke during the Republican National Convention. President Bush signs the Intelligence Reform and Terrorism Act of 2004. Hamid Karzai inaugurated as Afghanistan’s first popularly elected president. The Boston Red Sox wins The World Series. Michael Melvil pilots SpaceShipOne into space, becoming the first person to do so in a privately developed aircraft.